A man is driving in traffic. His daughter is in the backseat. All of a sudden, a car broadsides their vehicle. Gunmen get out and grab the man. Jack Bauer is at a Senate subcommittee hearing. He is being questioned about his torture practices regarding a terrorist. The hearing is interrupted when FBI Agent Renee Walker tells the court that Jack is needed for a national security issue. Jack is subpoenaed and gets the okay to leave the hearing. Michael Latham, the kidnapped man, designed the government’s firewall program. Jack is brought in to help with the situation. Larry Moss, head of the FBI, is running the team. Larry asks Renee, Jack’s new partner, to keep an eye on Bauer. Janis Gold, an FBI systems analyst, asks Larry if Jack has been indicted. Renee divulges to Jack that Tony Almeida is alive. Jack can’t believe it. Renee says that Tony is alive and well. She adds that the FBI is looking for Almeida. Jack brings up Tony’s funeral. Renee says that Almeida’s body wasn’t the one buried. Tony Almeida and his crew are trying to take over the control of an airplane. Tony needs Latham’s assistance, since he designed the CIP firewall program. There is a malfunction. Tony asks Latham why they can’t override the jet’s controls. Tony threatens Michael. President Allison Taylor watches a TV broadcast about General Juma. The President thinks that they need to stop Juma. Her husband, Henry, thinks that Allison should make a statement. Ethan Kanin, a White House chief of staff, doesn’t think that Henry is on board with his wife’s views. President Taylor admits that she is still grieving her son’s death, but says she can’t let her emotions get in the way of her decision to go to war. Tony tells his men to get into the system. They are able to hack into the airline system. The FAA notices the glitch. Jack asks Renee if Tony is undercover. Renee says that Tony is possibly looking for revenge for his wife’s death. Jack is still not convinced that Tony has turned rogue. Jack asks Renee for all the FBI files on Almeida. The FAA contacts Moss. Renee says that Almeida is using the firewall to hack into air traffic control. Renee updates Jack on the situation. Sean Hillinger, an FBI tactician, is asked to help Jack. There is a meeting with the Cabinet. The President wants the Secretary’s report on whether they should go to war with Juma. Allison is irritated by the Secretary’s lack of enthusiasm. She asks the Secretary to have his report ready soon. President Taylor is informed of technology thefts around the US. She is told there is an alert from the FAA. An FBI agent suggests decreasing air traffic for now. Henry tells a reporter that his wife has a post-war plan. Henry gets a phone call from his PI. Henry is investigating Roger's death. The investigator says that Roger's girlfriend received a large sum of money, which was put into her bank account. Ryan Gedge, a Secret Service agent, tells Henry that Roger's suicide has already been fully investigated. The agent thinks that the PI is taking advantage of Roger's grief. Janis tells Renee that they are in trouble if Almeida is using the firewall program. Jack asks Sean to look for information in their database. Jack asks Sean to look up a name: Gabriel Schecter, a man that Tony and Jack used to know. Moss gets into an argument with Jack. Renee tells Larry to cool down. Renee says that she is taking Bauer with her to talk to Schecter. Renee adds that the President wants results ASAP. Moss relents, but says that Renee has to keep an eye on Jack. Renee asks Jack how he got to know Schecter. Jack divulges that he and Tony were close friends at one time. 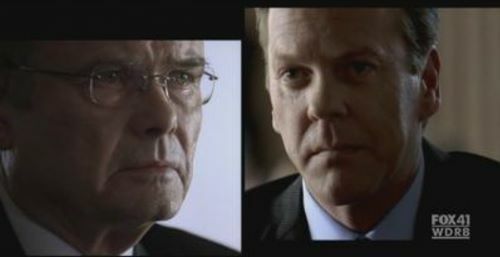 Jack finally accepts that Tony is alive, but wonders what Almeida’s agenda is. They arrive at Schecter’s office. The Secretary wants to know what people will think when they try to eliminate Juma. Kanin informs Allison that the firewall situation is being dealt with. A man answers the door at Schecter’s place. Gabriel is surprised to see Jack. Renee explains that Jack is there to help the FBI. Gabriel asks how Jack’s hearing is going. Schecter thinks that Almeida is dead. Jack brings up that Gabriel has been helping Tony this whole time. Gabriel still denies helping Almeida. Renee kicks Gabriel’s right hand man. Jack pulls a gun on Schecter. Jack wants to know where Tony is. Gabriel is adamant that Tony is dead. Jack is about to puncture Gabriel’s temple with a pen when Schecter finally admits to helping Tony. Schecter is about to say where Tony is when a sniper hits Gabriel, killing him instantly. The phone rings. It’s Tony. Tony tells Jack to stay out of his business. The airplane prepares to land, but the FAA loses the signal. The FAA alerts the FBI.